Ensure you are typing in the replacement key number from the lock face or the original key. Take out any spaces, and drop any other manufacturer names (e.g. “Bisley 92123” is just “92123”). If you still can’t find what you need, just take a good photo of your lock or key and email that to sales@lockdoctor.biz and we will do our best to help. I ordered the wrong key number, how do I go about getting the correct one? Please email sales@lockdoctor.biz with a good picture of your lock face (where the key goes in) and we will do our best to identify the correct key for you. Please quote your invoice number on the email and on the compliment slip when you return the keys. When will my keys arrive? Where possible we dispatch all orders received before 3pm on the same day. You should usually receive your keys next working day, depending on the post in your area. Click here to track the status of your orders by logging in. I need to get a copy invoice for my recent order, can you send me one? Copy invoices can be obtained by emailing accounts@lockdoctor.biz. Quote your invoice number or purchase order number to ensure it is dealt with speedily. For all other account related queries, please do email accounts@lockdoctor.biz. How do I order a new replacement key for my desk? The replacement key number is stamped on the front of our locks. Type the key number (including any letters e.g. FM123) into our search bar at the top of the page and when you hit enter it should take you to the key that you need. I typed in the number from my lock but there is more than one to choose from, which one should I choose? If you don’t recognise the type of key you need from the examples on our website, then take a good photo with your phone of the front of the lock and email to sales@lockdoctor.biz and we will do our best to identify the right type of key to order. I typed in my number, but nothing comes up. Ensure you are typing in your whole key number without any spaces. Take out any manufacturer names (i.e. “L&F 18 123” will just be “18123”). If you still can’t find what you are looking for, just email a picture of the existing key, or the lock face if the key is missing, to sales@lockdoctor.biz and we will do our best to help. On one side of the keyhole it says 18 but on the other side is 3 more numbers. Which type of key do I need? There are two main types of office furniture key that use the range 18001-18999.The most common type is the L&F England range. On the original key the full key number is stamped, e.g. 18123. But on the lock face the replacement key number might be stamped 18 on one side and 123 on the other, or in some cases just 123. Take a look at this info graphic of the difference between the 18 series. I’ve got loads of desk keys and filing cabinet keys to order, can I email you the list I have or do I need to type in each key number on your website? How do I order a new lock for my desk? Please find a link to the most common desk locks needed in the UK. If you’re not sure which one you need than take a good photo with your phone and email it over to us so that we can do our best to help. How do I get the broken key out of the lock? If you have broken a key inside the lock, try oiling the lock and make sure that the cylinder is turned to the “key out” position. If you still cannot pick the key out, then take a good photo and we will assess the situation and advise accordingly. There are two main types of office furniture key that use the range 18001-18999.The most common type is the L&F England 18 Series range. On the original key the full key number is stamped, e.g. 18123. But on the lock face the replacement key number might be stamped 18 on one side and 123 on the other, or in some cases just 123. Can you tell which type of key I need to order from the number on my lock? In most cases the range of key numbers that appear on the lock face or on the key will be enough for us to determine which keys to send you. Normally, you can just type in the replacement key number (e.g. FM123). Here is a link to the most common types of desk keys. If you order before 3pm we should be able to get the order in the post on the same day. There are two different numbers stamped on the front of my desk lock, please advise how to order the right key? Normally the number stamped on the front of the lock is the replacement key number, but sometimes the replacement key number might also include letters or two sets of numbers. If you take a good photo and email that over to us then we should be able to identify the type of key you need. I’m going away and need to lock my valuables in my desk at work. Which type of desk lock should I order? I need to order new keys for my filing cabinet. Can you post the keys I need today if I give you the number on the front of the lock? Yes sure. 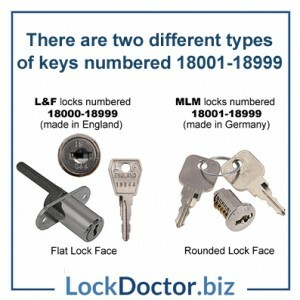 Type your key number into the search bar on our homepage at lockdoctor.biz, and select your key from the selection. If you are unsure which one is yours then email us a good photo of the lock face or the key and we will advise further. Click here to browse the most common filing cabinet keys used in the UK. You can also send us your official purchase orders to sales@lockdoctor.biz, or fax it to us on 0844 332 0247. I need to get new keys for my filing cabinet but I’ve lost the original keys, how do I order new ones? Or just type in the number (e.g. 344) into the search bar and click go to search our wide range of keys. If you are not able to tell which key you are after, just email us a good photo of the lock face or the key and we will do our best to assist. How do I order a new lock for my filing cabinet? Please find a link to the most common filing cabinet locks needed in the UK. If you’re not sure which one you need than take a good photo with your phone and email it over to us so that we can do our best to help. My old filing cabinet lock is broken. Please let me know which one is best to replace it? Please find a link here to the most common types of filing cabinet locks in use today. If you are unsure which one to order, just email us a good picture of your old/broken lock to sales@lockdoctor.biz and we will do our best to help. I’m a site manager and I need to order a long list of replacement keys. Do you provide a discount for large quantity orders? Our most common locker keys in the UK range from £2.95 for the single key, down to £1.40 for 200+ keys. Just email your list of keys and locks to sales@lockdoctor.biz and ask for a quote. I am a site manager and I need to replace a whole load of keys and locks for the banks of lockers I manage. What do I do next? For quick turnaround and a possible trade discount email the list of keys to sales@lockdoctor.biz. We can work straight off the list so just email the list to us and we will take it from there. You can also send us your official purchase order and we can send out the keys on invoice. My CC key has a black plastic head but your picture doesn’t show one. Sometimes, the manufacturer supplies these keys with a plastic fob. These have been a common cause of the key snapping in the lock. Our CyberLock CC Series range uses a solid piece of steel, for added reliability and quality. All of my locker key numbers start with CC, can you supply that type of key? There are two common types of keys starting with CC. The Ronis WSS Series is a very common locker key, ranging from CC001 to CC2000. Click this link to order that type. If yours has a black plastic head, please click the link for the CyberLock CC Range. The Cyber Lock Range is from CC0001 to CC0999. Sometimes the CC will be stamped below the actual number. It will always start with a 0. If you are unsure which key you need, send a picture of your lock face or key to sales@lockdoctor.biz. It usually takes 10 days for me to get replacement keys, how long does it take from you? We supply over 100,000 keys and locks next day. Where possible, we get all orders out on the same day if it received by 3pm either by 1st Class Royal Mail or courier. There is no number stamped on the lock face, can you help? Sometimes manufacturers streamline their processes and don’t stamp the key number on their lock faces, thus saving money. We may be able to supply replacement keys for these cheaper locks, if we could see a picture of the lock face or the key. Please email a picture to sales@lockdoctor.biz and we will advise further. I need to order a lot of locker locks. Do you offer quantity discount? We can offer discounts for large orders of over 100 locks or more off the list price. Email sales@lockdoctor.biz with your query, and we will produce and send you a voucher to use at our online checkout. Click to browse our full range of locks for lockers. The arm on the back of my locker lock has snapped off, do you supply the arm on the back? The cams on the back are what holds the lock into place. It sounds as if you may need to replace your locker lock entirely, and with our range of locker locks starting from £6.45 you will also get 2 new keys. We also supply the cams for the back of the locks if you feel you can repair it yourself, or need to change its length. Browse our range of cams for locker locks here. I am a site manager at a school and I need to order over 100 locks, do you offer any discount? Just email your query to sales@lockdoctor.biz and we will get straight back to you with your wholesale discount. At various times we run promotions on our best ranges of keys and locks. Be sure to follow us on the buttons below to ensure you don’t miss out. I manage large banks of lockers. Do you have a master key that will work for me? If you can’t find your master key, just take a good photo of the existing key, or the lock face if the key is missing and email that to sales@lockdoctor.biz. Click here to browse our full range of master keys. My Garran Master Key isn’t working on any of my Garran locks over G6000. What should I do? For some ranges there may be two master keys. For the Garran Series, if your locks are ranged G1001-G5000 you need an M21A. For the range G6001-G9999 you may need the M21B. Click here to view our Garran Keys – Garran Master Keys – and Garran Locks. What does keyed alike (KA) mean? Keyed Alike (KA) means that the locks all work with the same key. Keyed Alike locks are common with site managers, as it allows them to have access to multiple entry points carrying only one key. You can order keyed alike padlocks by ensuring it says Keyed Alike or KA in the title on our padlocks page.